All ministries are required to contribute a specific part of their budget to the tribal sub-plan. During the last few years, the fund has received hundreds of crores of rupees. But where was the money spent? To summarise, the money meant for the development of tribals has been spent on preparing grounds for their displacement. Mining, whether for coal or any other mineral, is usually carried out in tribal areas of the country. The government of India had set up the fund in order to support tribals who face problems or are displaced as a result of mining. After the Planning Commission was dissolved and replaced by the NITI Aayog, the tribal sub-plan was renamed the Scheduled Tribe component. Using the Right to Information, we tried to find out where and how the money was used under the scheme. The response to our query revealed how the fund allocated for the development of tribals was used in ‘other works’. These ‘other works’ are likely to lead to further displacement of tribals or cause them other problems. First, we need to know the purpose of the tribal sub-plan. The Planning Commission had clearly stated that the money allocated under it is to be used for the overall development of Scheduled Tribes. With the money, schemes were to be devised which would directly benefit tribal communities. The Planning Commission had said that 8.2% of the coal ministry’s budget and 4% of the Ministry of Mines’ budget had to be set aside for the fund. Both ministries must have deposited the amount fixed under this plan every financial year. But was the money actually used for the development of tribal communities? Between 2010-11 and 2017-18, how much money did the two ministries allocate for the fund, how much of it was spent and where was it spent? Information obtained through the RTI Act brings out a shocking truth. The fund was invested in tasks which are most likely to bring about the destruction of tribal communities instead of developing them. The figures provided by Ministry of Coal and Ministry of Mines reveal that the money is being spent on activities which cannot be considered pro-tribal at all. According to data and documents obtained, the coal ministry allocated the fund to government coal companies – CCL, SCCL and MCL. Instead of spending money for the development of tribal communities, the companies used the money for regional exploration, stowing, detailed drilling and security of mines. These activities are all directly related to mine detection and protection, and clearly, their objective is to find more mining opportunities and locate more mineral reserves. The fund, therefore, which was meant to benefit the tribal communities, is being siphoned off for activities that are likely to bring more harm to them. Meanwhile, the Geological Survey of India, regulated by the Ministry of Mines, received Rs 6,621 lakh under the tribal sub-plan between 2010-11 and 2017-18. The GSI spent the money in conducting surveys to locate mineral reserves in Kolkata, Nagpur, Jaipur, Hyderabad, Lucknow and Shillong. 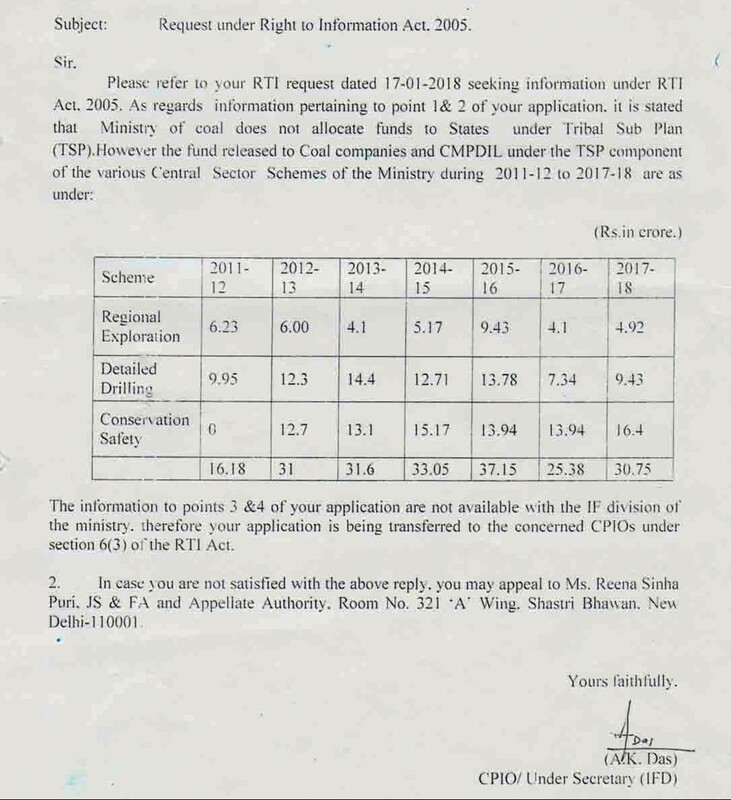 In response to an RTI query dated February 26, 2018, the coal ministry said that the ministry does not fund the states under the tribal sub-plan, but the fund is issued to government coal companies and the Central Mine Planning and Design Institute Ltd (CMPDIL). Between 2011-12 and 2017-18, the coal ministry released Rs 205 crore in this regard. The coal companies and CMPDIL spent the money on works related to exploration of coal reserves, excavation, mine conservation and protection of mines. 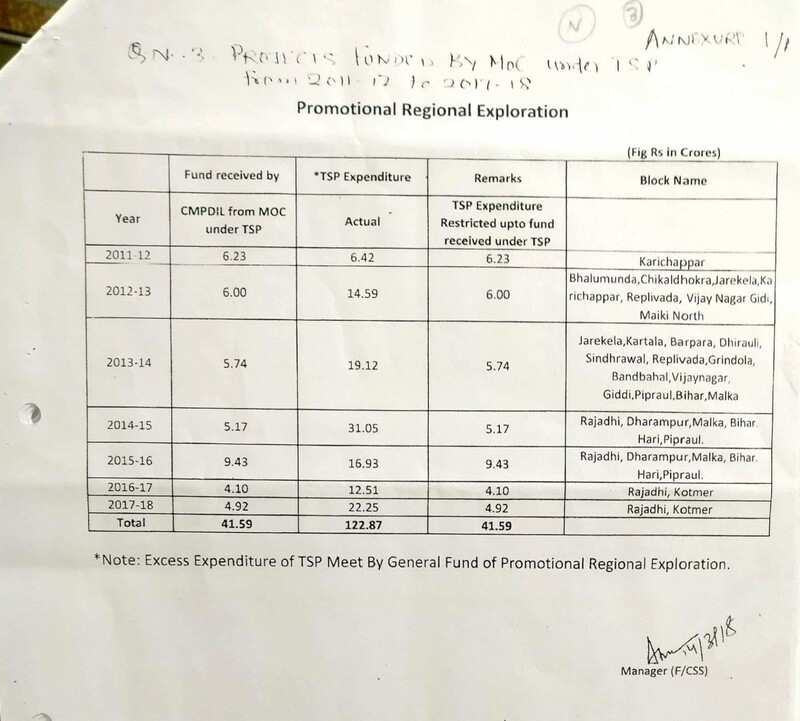 According to the reply received from CMPDIL, a total of Rs 41.59 crore was spent on promotional regional exploration to locate coal reserves between 2011-12 and 2017-18. The company also received Rs 82.32 crore for detailed drilling. The CMPDIL spent the plan money in 20 blocks of Chhattisgarh, Andhra Pradesh, Madhya Pradesh and Odisha to look for coal deposits. In fact, the company even provided a geographical report on 14 blocks, while work is still in progress in the remaining six blocks. The CMPDIL used the money allocated under the TSP on detailed drilling in nine blocks in Chhattisgarh, two blocks in Odisha and four blocks in Madhya Pradesh. Significantly, the CMPDIL’s actual expenditure on these activities was far more. For instance, it spent a total of Rs 122.87 crore on exploration but it also added plan money worth Rs 41.59 crore to it. The Office of the Coal Controller Kolkata, another organisation under the coal ministry, informed us that the tribal sub-plan fund was handed over to the Central Coalfields Ltd (CCL), Singareni Collieries Company Ltd (SCCL) and Mahanadi Coalfields Ltd (MCL). These government coal companies carried out activities like stowing and protective work with this money in Jharkhand, Andhra Pradesh, Odisha and Telangana. Stowing is in effect a way of releasing pressure on the mine. According to documents obtained through the RTI, the government companies spent Rs 12.71 crore in 2012-13, Rs 13.10 crore in 2013-14. Rs 15.17 crore in 2014-15, Rs 13.94 crore in 2015-16, Rs 16.53 crore in 2016-17 and Rs 16.40 crore in 2017-18 on such activities. The question then arises: In what ways have tribals benefited from the excessive amounts doled out in the name of the tribal sub-plan? An important question that arises next is how the other ministries receiving funds under the tribal sub-plan are spending the money. A Comptroller and Auditor General report from 2015 shows that states which do not have a tribal population as per the 2011 Census also received money under the tribal sub-plan. In 2010, the Planning Commission said that if the plan’s fund is not utilised, it should be passed on to the Ministry of Tribal Affairs. But these instructions have also not been followed. Let’s look at how the tribal sub-plan fund was managed by the textile ministry during the last seven or eight years. Only 1.2% of the ministry’s total budget is set aside for the tribal sub-plan. But in the financial year 2017-18, the ministry allocated 6.2% of the budget for the tribal sub-plan, which amounts to Rs 61.81 crore. Of this, Rs 30 crore was given to National Handloom Development Corporation Ltd (NHDCL). We filed an RTI to find out how the NHDCL spent the money it procured under the plan. Surprisingly, according to the response received on July 26, 2018, it did not receive any funds under the scheme. 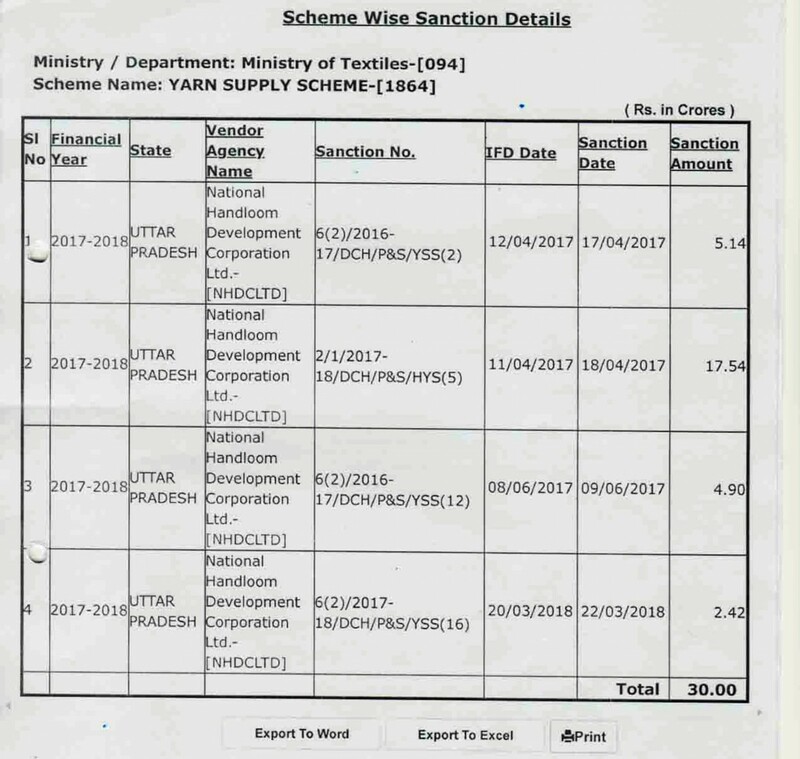 Meanwhile, another reply from the textile ministry’s development commissioner (handlooms) dated August 7, 2018 confirms that not only was the tribal sub-plan fund disbursed for the year 2017-18, but an additional Rs 115.59 crore had been distributed since 2012-13 under the head ‘handloom’. He also wrote in another reply on August 13, 2018 that the budget allocation for the block-level Cluster Development Programme under the tribal sub-plan was done only under the National Handloom Development Program since 2012-13. During that year, Rs 40 lakh was spent in only four states. In 2013-14, the grant was increased to Rs 68.27 lakh. By 2017-18, it came down to Rs 18.19 lakh. According to the NITI Aayog website, Rs 1.47 crore was issued to 20 organisations during the financial year 2017-18. However, a response to an RTI reveals that only four organisations received a total of Rs 18.19 lakh. The figures expose the actual status of Modi government’s target in terms of job creation. The RTI response also reveals that no organisation has sent fund usage certificates after 2014-15. A reply to another RTI query, dated August 8, 2018, also shows that under the Handloom Weavers Comprehensive Welfare Scheme, the tribal sub-plan fund was issued to the Life Insurance Corporation (LIC) and ICICI Lombard, Mumbai, so that ST weavers can avail health insurance benefits. However, the figures are disturbing here as well. In 2013-14, Rs 1.61 crore were released for insurance coverage. But in 2017-18 the amount had been decreased to Rs 32 lakh. This indicates two things. First, the number of final beneficiaries has decreased drastically and second, nearly 80% of the beneficiaries have either become unemployed or have been removed from the scheme. With respect to the comprehensive handloom cluster development plan provided in the budget since 2015-16, it was found that no funds have been allocated under the tribal sub-plans. This clearly points to the Central government’s apathy towards tribal communities. The Central Wool Development Board gave the most interesting response to our RTI query. The CWDB had procured Rs 7 crore from the tribal sub-plan fund between 2010-11 and 2017-18 and disbursed Rs 6.63 crore – not to an individual, but an organisation. However, the board claimed that they do not keep a record of those organisations which receive the fund. In our country, we have an entire ministry dedicated to serving tribal communities. So what are its ministers doing, especially when all facts regarding the tribal sub-plan are known? Back in 2015, the Ministry of Tribal Affairs had raised an objection to the tribal sub-plan fund being spent on other activities. Yet, it seems, no heed was paid to it as the work is still going on. According to the ministry, a total of 37 ministries and departments are provided funds under the tribal sub-plan and 289 schemes are included in it. But where is the money spent is the biggest question. Now, the government can say that the plan does not have any constitutional or legal cover, which is why its money is spent on other activities. But can this be considered a moral act? What else will you call it if the fund allocated for one purpose is siphoned off and activities are carried out instead which do the exact opposite? Is that a moral crime, or an instance of corruption? An excerpt from Vaada Faramoshi, a book which evaluates the Modi government’s major schemes, published with special permission. Based on information received through the RTI, this book is written by Sanjoy Basu, Neeraj Kumar and Shashi Shekhar.